You are currently browsing the category archive for the ‘green frog theory’ category. Seeing these things pop up month after month, the total effect gets ignored because of a stupid comment Donald Trump tweets that day…. So, did you know… That one year ago, April 2015 was also the hottest April EVER recorded…. And that May 2015…. was the totally hottest month of May, ever recorded? And that June 2015…. was also the hottest month of June, ever recorded? And that July 2015…. was also the hottest month of July, ever recorded? And that August 2015…. was also the hottest month of August, ever recorded? And that September 2015, was also the hottest month of September, ever recorded? And that October 2015, was also the hottest month of October, ever recorded? And that November 2015, was also the hottest month of November, ever recorded? And that December 2015, was also the hottest month of December, ever recorded? And that January 2016, was also the hottest month of January, ever recorded? And that February 2016, was also the hottest month of February, ever recorded? And that March 2016, was also the hottest month of March, ever recorded? Which brings us around to April 2016… Which was hotter than last April which at that time was the hottest April ever recorded…. Did you know this? I didn’t. I had no idea it was this bad, so I thought I’d share…. I guess I could preach a little about how we should have to do something. But, what’s the point. If you read this and don’t come up to that conclusion yourself, then you certainly won’t listen to my little spin at the end…. If current trends continue, estimates are the Bald Eagle will be extinct by 2020. 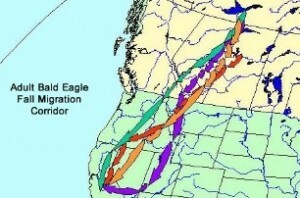 It appears that the American Bald Eagle is picking up some type of neurotic toxin in the Athabasca Tar Fields of Canada. Athabasca Tar Oil is obtained by pumping toxic chemicals into the bedrock to flush out thick oil. Those toxins can then contaminate wildlife when they leak. Mercury content in water samples has increased by 40% from 1979 to 2009. These oil fields and methods are developed by the Koch Brothers, the same organization which funds the our local Caesar Rodney Institute. This is the same entity that is currently pushing for the Keystone Pipeline to cross the aquifers of the Midwest thereby enabling the Koch Brothers to sell oil to America’s future enemies, most notably called out by Allan Loudell on his blog today, as China….. The Ogden rehab center said all the sick eagles seen suffered from encephalitis, or swelling of the brain, and many had heart damage. Currently there are only 9,789 Bald Eagles breeding in the US. Coupled with the mysterious die off of the Monarch Butterfly, the American Moose, and now the Bald Eagle, this makes 2013 a very cataclysmic year for traditional North American icons. The canary has stopped singing in the coal mine…. Whew, Dodged A Bullet. Not As Bad As Last Summer! Following rapid ice loss in the first half of July, the pace of seasonal ice retreat slowed the rest of the month partly due to the return of a stormy weather pattern over the central Arctic Ocean. 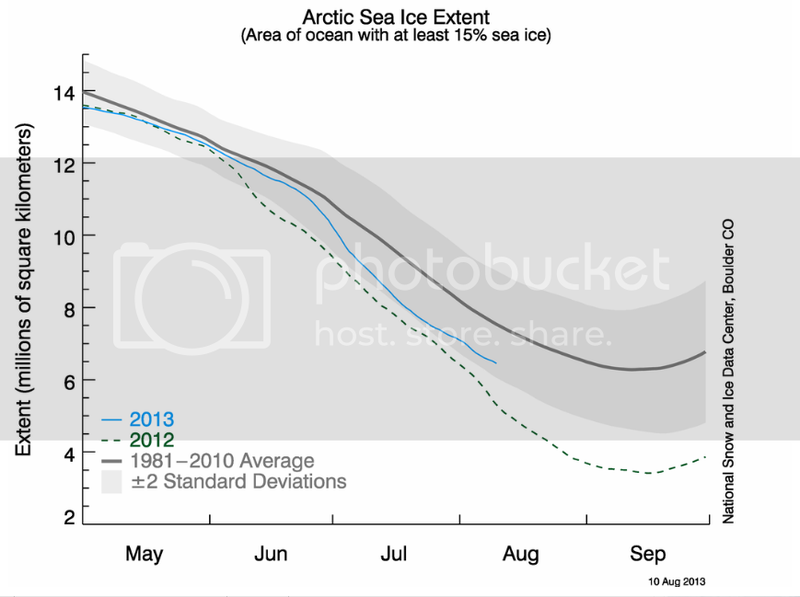 The timing of melt onset for 2013 was in general unremarkable. Ice extent remains below average on the Atlantic side of the Arctic, and near average in the Beaufort and Chukchi seas, and along the Eurasian coast….. In a discussion about global warming, one John Galt gave this piece of enlightenment…. this is dug up here for historical reasons and it is well worth remembering the arguments of the past as we now investigate such problems as raising taxes, protecting social security, and increasing labor participation against the same faulty reason…. It is a walk down memory lane, accompanied by knowing we were right on the issue of global warming, and Republicans were very, very, very, very, very, very…. wrong…. by John Galt July 17, 2009. All of your claims are wrong and you know it or your an idiot. Global temperatures peaked in 1998, a fact that contradicts the assertion that man’s continued pumping of carbon dioxide into the atmosphere is making the planet hotter. This was not predicted by the climate models that say we’re headed for a warm period. Nor can anthropogenic global warming be explained when introduced into the argument is the fact that 1934, when far fewer carbon-spewing machines existed than we have today, is the hottest year on record. Global warming alarmists invested heavily in convincing everyone that 1998 was the hottest year and 2006 the third warmest. After correcting for faulty data, NASA had to backtrack. Researchers at the U.S. National Snow and Ice Data Center admitted that “sensor drift” in the satellite monitors used to measure sea ice caused them to underestimate the extent of Arctic sea ice by 193,000 square miles. That’s a significant area roughly the size of California. In a column titled “In 2008, a 100 Percent Chance of Alarm,” New York Times columnist John Tierney exposes the Chicken Littles for what they are — opportunists and alarmists who in this new year “will bring you image after frightening image of natural havoc linked to global warming.” Inconvenient truths and scientific fact will be ignored. Less dramatic and newsworthy was the announcement that the same satellites also recorded that the Antarctic sea ice had reached the highest level ever. But then, polar bears allegedly drowning and icebergs breaking away are good theater. We’re told the Larsen B ice shelf on the western side of Antarctica is collapsing. It is warming and has been for decades. But it comprises just 2% of a continent that otherwise is cooling. In the same week Gore received his Nobel Peace Prize, the respected scientific journal Nature published a paper you probably didn’t hear much about. It concluded that global warming had a minimal effect on hurricanes. In fact, after Katrina, hurricane watchers have had trouble getting as far as the letter “K”. “The last couple of years have humbled the seasonal hurricane forecasters,” says Max Mayfield, a former director of the National Hurricane Center in Miami. The 2007 season was the third calmest since 1966. 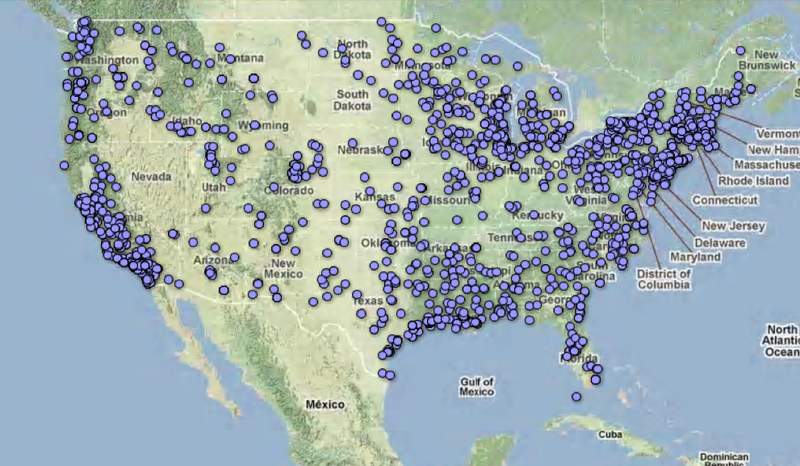 In 2006 not a single hurricane made landfall in the U.S.
That must be why in January 2007 some $1.42 billion worth of California produce was lost to a disastrous five-day freeze. A few months earlier Gov. Schwarzenegger signed the California Global Warming Solutions Act of 2006 designed to, uh, help cool the climate. In 2007, Australia experienced its coolest June ever. The city of Townsville underwent its longest period of continuously cold weather since 1941. Johannesburg, South Africa, had the first significant snowfall in a quarter-century. Let me make this as simple as possible. Greenhouse gases makes up 2% of our total atmosphere. Of that 2%, 3.62% is CO2 and of that 3.4% is caused by man, yes only 3.4% of all CO2 is man made, the rest is made by nature. Man made CO2 makes up .000024% of the atmosphere. If they were this wrong on global warming, can they possibly be right on anything? Can someone tell me why we even listen to them anymore when they whine? For the most awesome replies…. it is here…..